The TCL QLED TV brings with it good 4K and 1080p performance and the sound output for a TV is good too. However, the HDR performance could have been better and the UI lags a lot especially when tweaking the settings while watching HDR content. 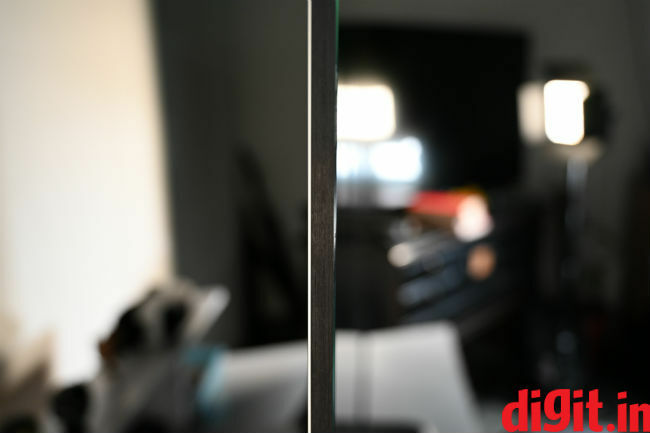 We recently reviewed the iFFALCON 75-inch TV at Digit and I am bringing this up because not only is the iFFALCON a sub brand of TCL, but hide the logo and you wouldn’t be able to tell which TV is which as they look identical (of course barring the size). The TCL 65-inch X4 has the same steel frame all around it because of which, the TV isn’t the slimmest. There is no fancy glass border either. Coming to the table top stand, it is a rectangular stand which sits flush below the TV. It has a small footprint which means you don’t need a large table for the TV. Overall, the TV is as well built as the iFFALCON we reviewed. It is sturdy, sits well on the stand and overall, well built. Coming to the connectivity options, they are all laid out on the right side of the TV, once again in the exact same order seen on the iFFALCON. You have 2 USB ports, 3 HDMI ports, a LAN port, Antenna port, SPDIF out, AV in and headphones out. Since most flagship TVs at this price have 4 HDMI ports, some of you may miss the 4th port. One of the three HDMI ports is ARC which is nice. The ports are neatly laid out even if they aren’t in order. 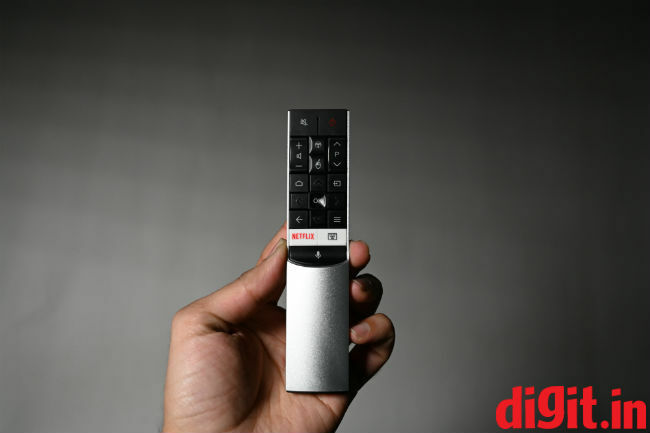 The lack of order is helpful as you may have devices like the Fire TV stick which need more space and can be used with the HDMI port that lies secluded towards the bottom. Coming to the display panel, this is different from what we got on the iFFALCON TV. This time around, we have a QLED panel. For those that don’t know, QLED is a technology that is mostly found on Samsung TVs. 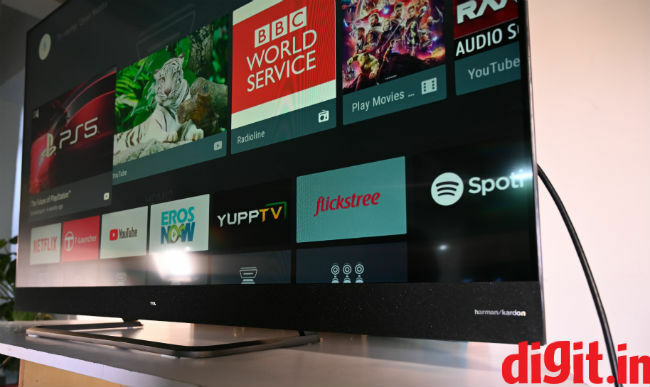 It is said to be better than traditional LED TVs bringing with it better colour reproduction, better viewing angles and doesn’t have the problems of OLED like reflective displays and burn in. So it should be the perfect tech for TVs right? Well, the answer isn’t a simple yes or no, as OLED has its own advantages too. Before delving into our test categories lets run through some picture settings first. 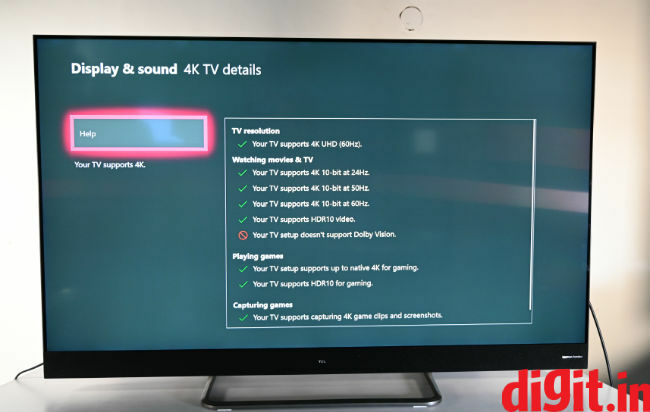 The TCL QLED TV has some of the same picture presets found on the iFFALCON. For the most part, the presets change based on the content playing on screen and should work fine. But if you want to tinker with the settings then know that for your set top box the standard setting should do fine. For movies, the movies setting works. But if you want to go deeper, there are settings to change the tone from warm to cool and even neutral. Stick with neutral for the most part but some games look better when the setting changes to warm. This essentially helps with skin tones in games like Rise of the Tomb Raider. Let’s get into the picture performance of the TV. There are times when we have access to content in 4K that isn’t HDR and then there is 4K content that is produced in HDR. 4K content on this TV looks great from the get-go. A good source of 4K content, though compressed, is YouTube. Play a game trailer, a movie trailer, some 4K clips showing nature or wildlife and you will be blown away by the performance of the panel on this TV. The colours look bright and vibrant and deep. Needless to say, 4K content looks fantastic on it. 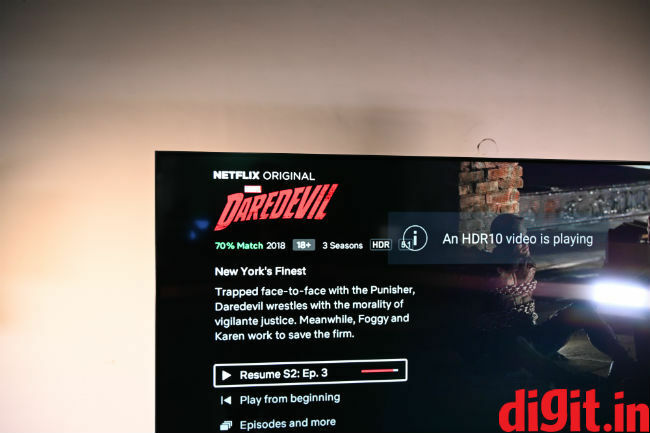 Switch the HDR on, and the story is a slightly mixed bag, reminding me of the 49-inch Xiaomi Mi TV 4A Pro which we reviewed some time ago. Let me explain this taking examples of content we consumed on the TV. Our test bed included Star Trek Discovery which is in 4K and HDR, Daredevil on Netflix, again in 4K and HDR. For the 4K only content we relied on YouTube. The problem with Daredevil Season 2 Episode 3 staircase fight sequence was that it was a little too dark for my liking. Even after tinkering with the settings, where by the way, the backlight was full along with the contrast, I had to tinker with the colours and saturation to get a brighter image and still it looked a little dull. The details in the dark were lost. Moving to Star Trek Discovery S1E1, when Burnham takes off from the ship for the first time, there are good details in the darkness of space and her suit. But when she is rising for the platform for the first time, the impact of the sun is a little less than what we have seen on other TVs like the Panasonic FX800D (read our review here). Switch to watching the same in 1080p from a fire TV stick, and the image looks brighter overall. It is safe to say that the 4K performance of the TV is a lot better than its HDR performance. Gaming is plagued with the same issues with one difference. In a game like Forza Horizon 4 (read our review here) which is in 4K and HDR, the game has the same dim performance problem we spoke about earlier. Shifting to game mode doesn’t help with the picture performance either. However, when we switch to a game like Doom which is in 4K and does not support HDR, the result is quite different. The picture is bright and vibrant and just to draw a comparison, we did not face saturation issues like we did on the iFFALCON TV. The game was a lot of fun visually from the dusty orange surface of mars to the technology littered indoor environments. One game that worked along the middle ground is Rise of the Tomb Raider. Moving between a naturally lit outdoor environment to an indoor dark room full of guards, the transition was seamless with the lighting and enemies hiding in the dark were easily noticeable thanks to reflections on their outfits or weapons. Overall, the 4K performance of the TV is good but the HDR performance could have been better. The vibrance we saw in the non HDR 4K content is present in the 1080p content as well. From Spider-Man Homecoming to Wonder Woman and even John Wick all the movies look bright and vibrant. From the dark scenes were Spider-Man takes on the Vulture to the bright scene where he stops the elevator from falling. The colours pop out and the scenes look well detailed. Even in John wick, the basement red circle fight sequence is fast paced, filled with red and blue colours and one to truly enjoy. Its safe to say that 1080p content on the TV looks really good. 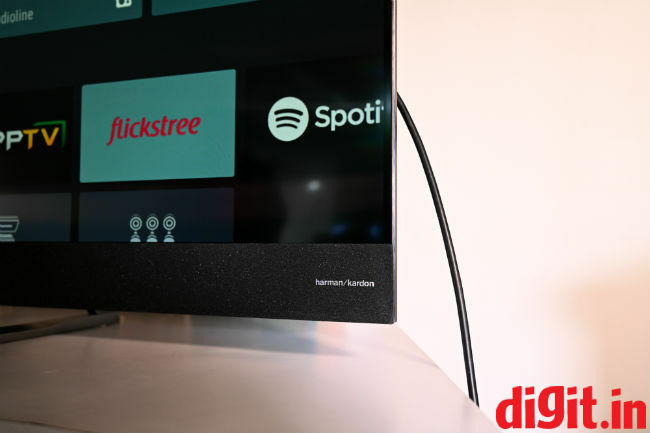 Just like the iFFALCON TV, the TCL X4 has 3 speakers on either side of the soundbar that rest below the TV with the Harman Kardon branding in one corner. The performance of the speakers is also almost the same. You have loud clear and crisp audio which lacks the distinctive punch of bass. The rock soundtrack in Doom can immerse you but when you fire the shotgun, you’d wish the sound packed as much of a punch as the gun in the game. There is nice separation in the sound when watching movies or playing games be it between gunfire and conversations in Tomb Raider or in the background score and the guns in Doom. The performance of the speaker will work for watching TV, playing games and watching movies. But for more immersive experience, you need at least a subwoofer. A great thing about the iFFALCON TV… oops.. sorry, the TCL TV…. This is what you get when the remote is absolutely the same for both the TVs. 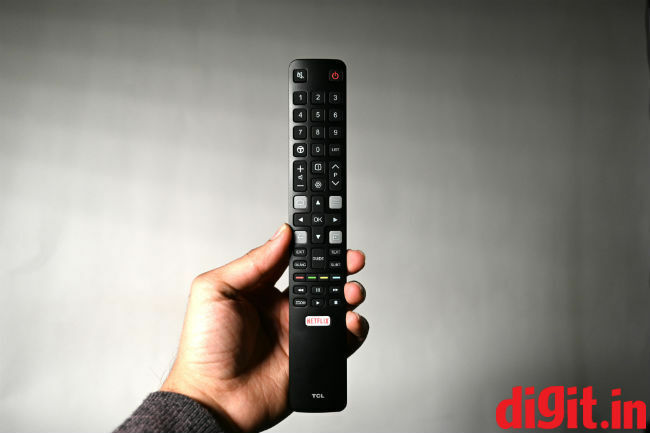 Let me redirect you to my review of the iFFALCON TV as the remotes are identical be it form or performance. 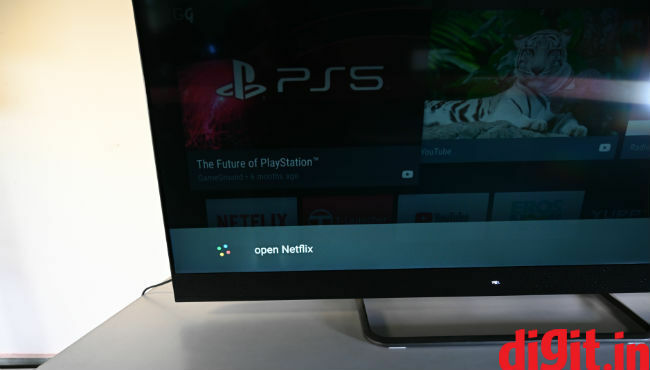 Even though the iFFALCOM TV and the TCL TV have the same Android 7 TV UI, I found it to be a lot slower on the TCL TV especially when HDR content is playing on screen. 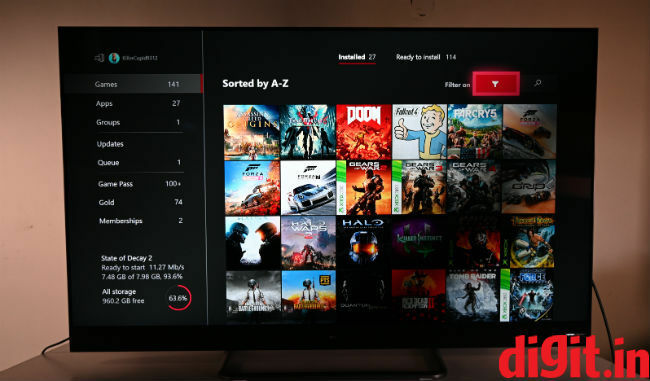 At times, either the Netflix app crashed while trying to tweak the settings, at other times the OS crashed when tweaking the settings with the Xbox One X connected. 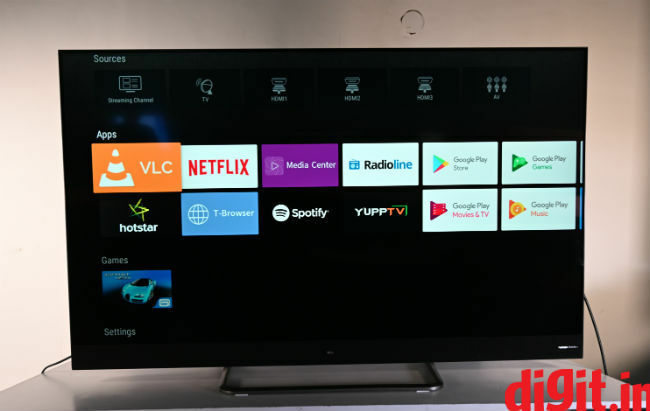 The UI is Android TV with the TCL settings thrown on top of it and the experience is mostly frustrating with sprinkles of smooth UI coming at some intervals. The voice search worked a lot better than on the iFFALCON. You can say things like open Netflix and it works. you can say things like “Haunting on Hill House” and it will bring up info and also tell you that it is available on Netflix, which is nice. Overall, it works like how Android should work. There are a lot of TVs from players like Sony, Samsung and LG at the Rs 1,00,000 price point that we haven’t tested so it is difficult for us to tell you about alternatives at this price point. So lets tell you this. The TCL QLED TV has some fantastic 4K and 1080p performance. It is a good TV for console gaming too. However, the UI lags a lot and the HDR performance could have been better. If you are looking for a good 4K performing TV in a large form factor for a Rs 1,00,000 budget, then you can definitely consider this TV.